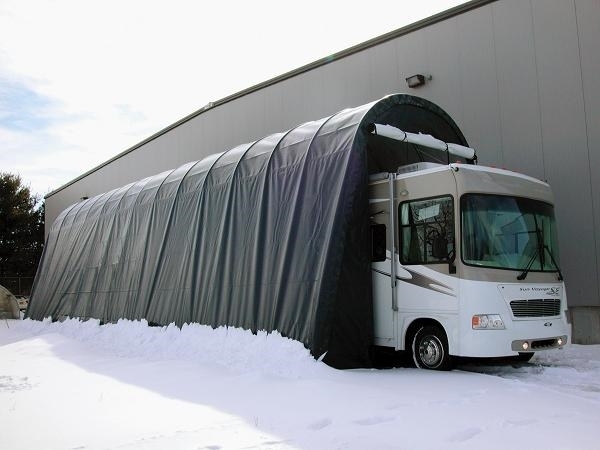 RV carports and shelters protect your vehicle from harsh weather conditions. Owners of RVs know that this is a considerable investment and taking care of your it is nothing more than taking care of your investment. After all, you would want to use your RV for many years and travel in comfort. 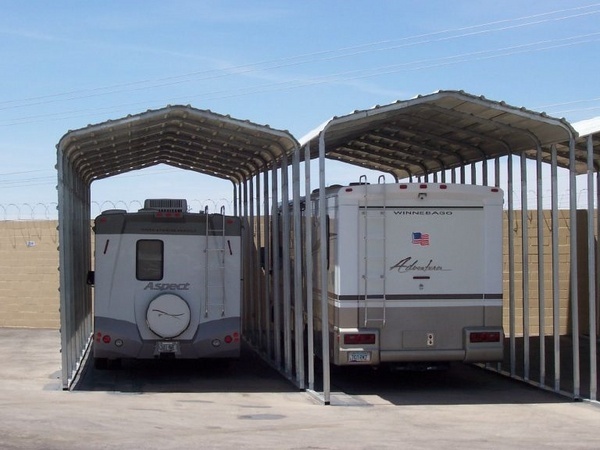 There are different types of carports and we shall look at the major factors that you need to take into consideration when choosing them, some types of constructions and materials, so that you know what the best way to care for your RV is. 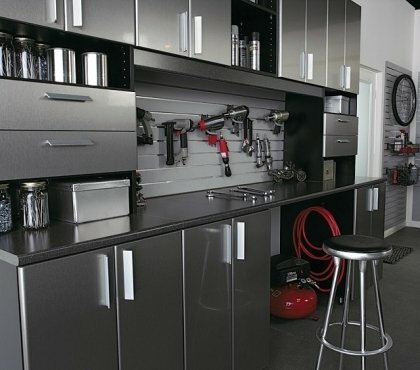 Many RV owners have a problem storing their vehicle when not in use as it is often too big to fit in a house garage. Very often there are regulations which restrict parking an RV on the driveway. Using a parking facility is one option, but you could always build a carport to keep the vehicle in for the time when you are not travelling. 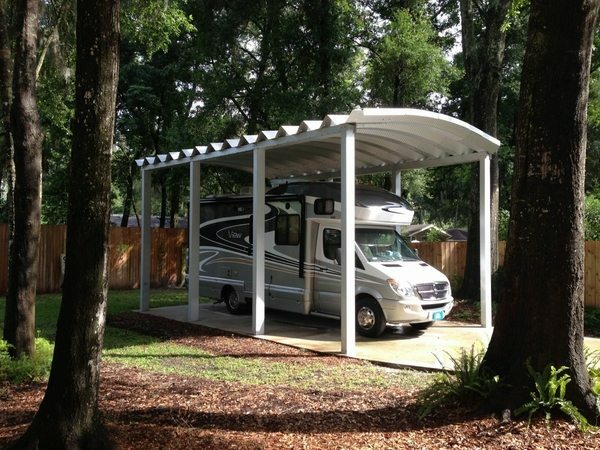 What is important to know when choosing RV carports and shelters? 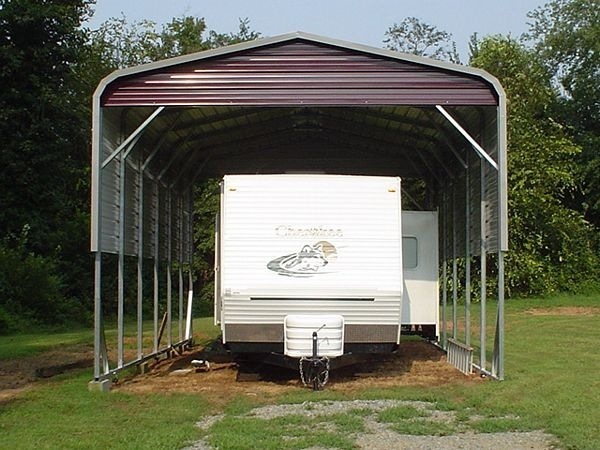 When choosing RV carports and shelters it is important to decide what type will work best for you. 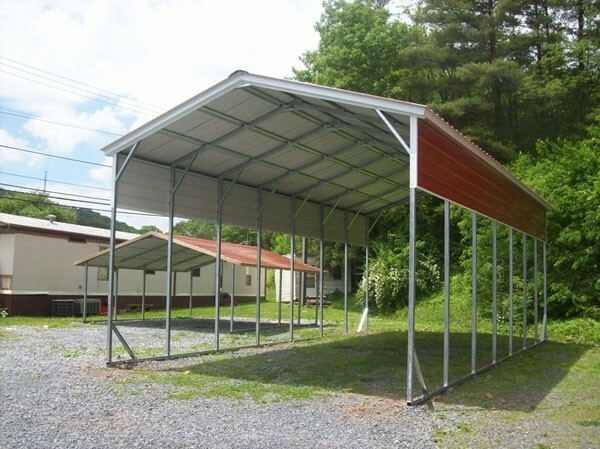 Metal carports are very popular and many companies offer a variety of models. 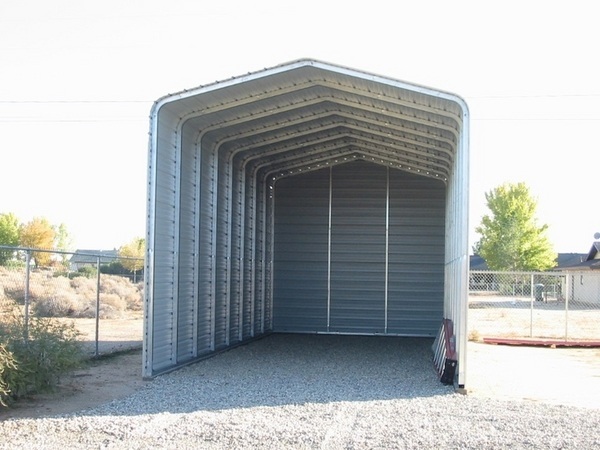 Some metal carports will provide protection from weather, others offer additional storage, there are many options to customize the carport for multiple vehicles, which can accommodate your RV and car, boat, tractor or any other vehicle. Another major consideration is the location. 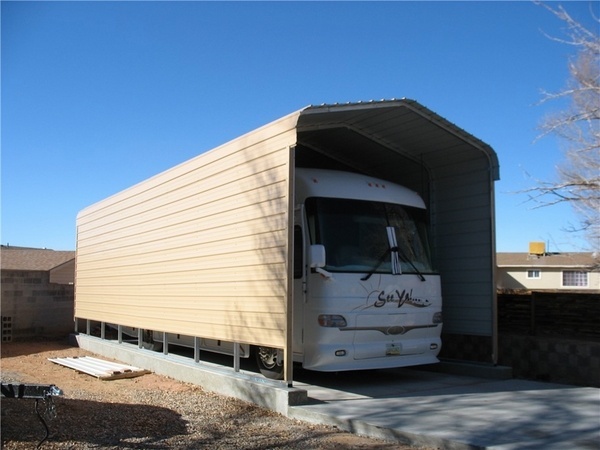 You need to have enough space to install an RV carport and provide access to the installation or construction team to the spot. 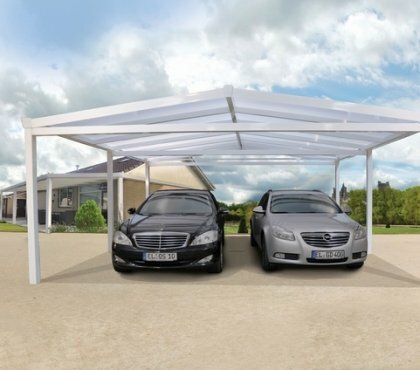 It is best if the carport is installed on a level space so you need to make sure there is a suitable spot. 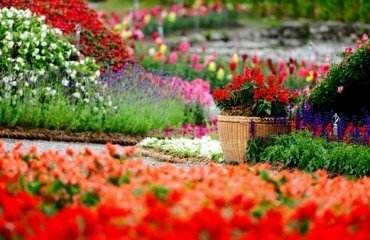 The length and width will depend on the available space as well as on the possibility to store one or more vehicles. You need to decide whether you would like to store other items – a boat or family bikes – or just the RV under the carport. 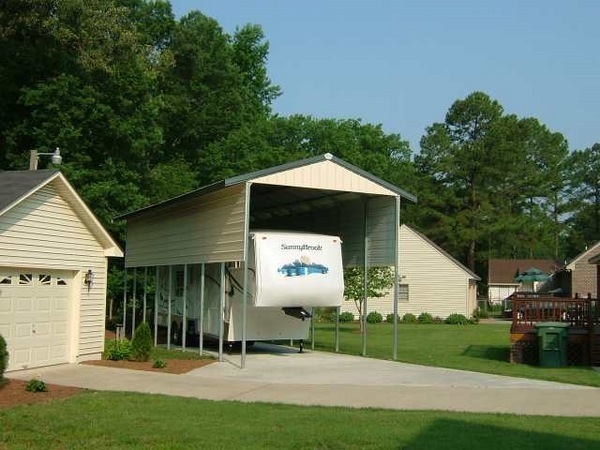 Height is another consideration as your RV should be getting in and out of the carport easily and clear the lowest point of the carport. Check the local building regulations and if necessary, get the required permits. 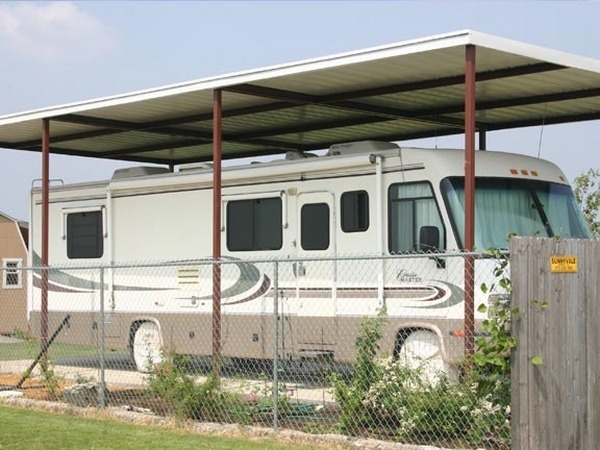 You may need to certify your RV carport or shelter. 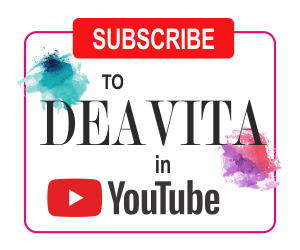 It is advisable to consult with the manufacturer as they are acquainted with the requirements and even if not, they will give you useful advice which institutions you need to contact. The type will also depend on the local weather conditions. 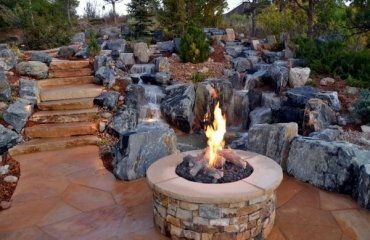 In areas with heavy snowfall and rainfall it is best to consider a more solid structure which offers good protection. In case of strong winds the construction will require a concrete slab and anchoring. 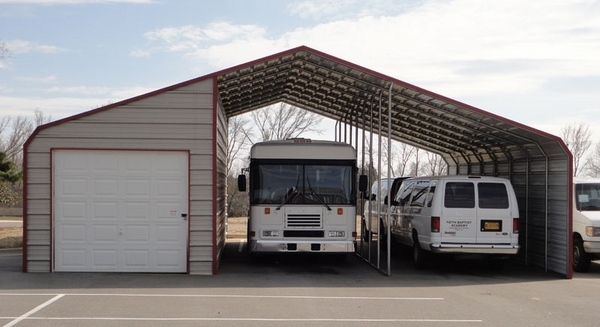 Some RV carports and shelters may need to be anchored and the base, whether asphalt, concrete or solid ground, has to be prepared prior construction. 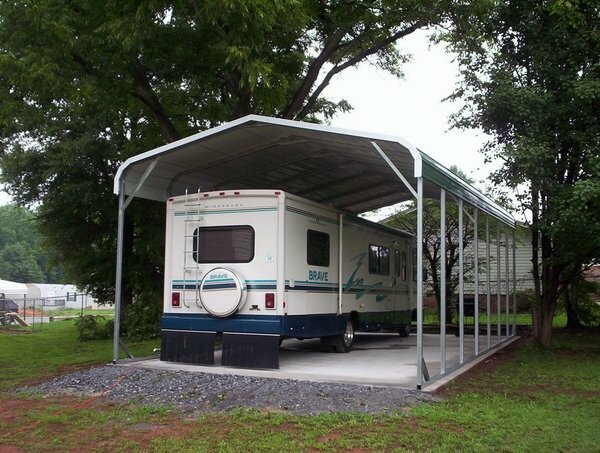 Last but not least, consider the appearance of your RV carport as there are many options to customize the way it looks. 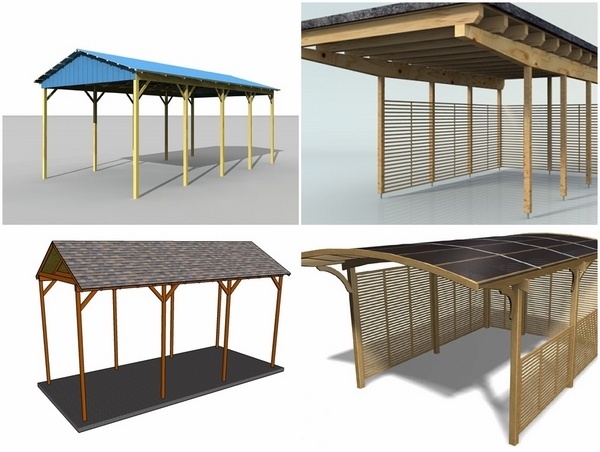 On the first place choose the material, the roof type, the color, side panels, if needed so that you have a carport which suits the exterior design of your outdoor space. There are different customization options to choose from. Gable ends add a finished look and additional strength to the structure. 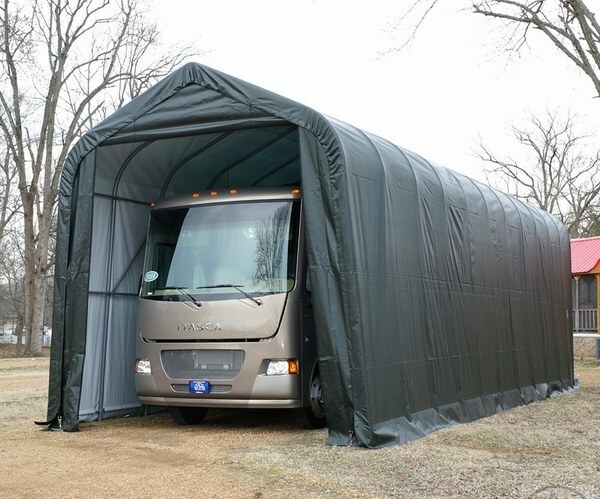 Side panels are especially important for a better protection of the vehicle and will also provide additional strength and support to your RV carport. 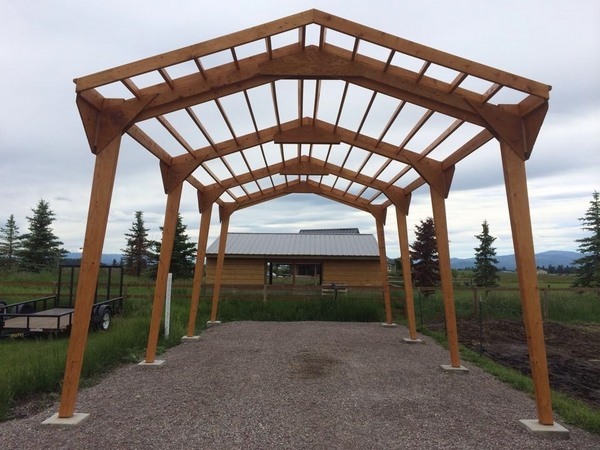 Consider adding extra bows and trusses to make your carport stronger as they will give extra structural stability. Any other additional trims should be considered on the planning stage with respect to safety and visual appearance. 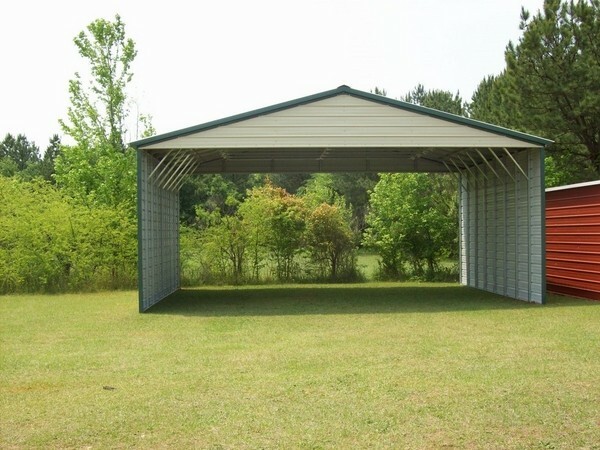 Whether you opt for a metal RV carport or wooden construction the type of roof is important as it will be the main protection of your vehicle from weather. 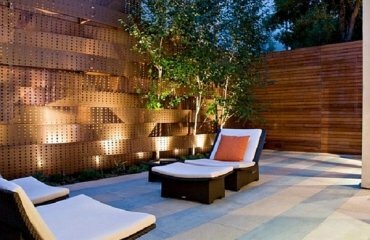 It has to be strong, durable and match your house exterior. A regular roof is cost effective and a good option for areas with moderate climate conditions without strong winds and heavy snowfall. It will provide excellent protection from sunshine and will make sure that your RV shall not be damaged from exposure to the sun. 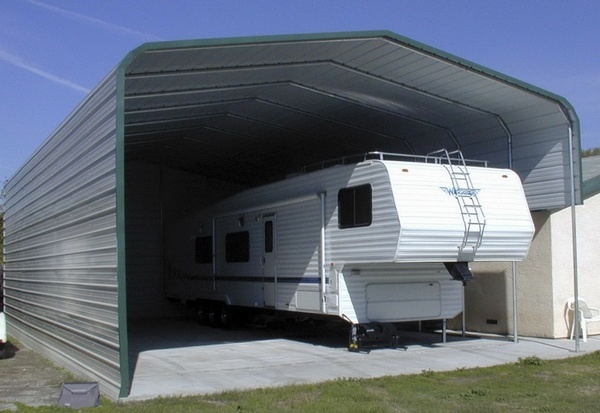 A vertical RV carport roof is the best option for areas with heavy rainfall and snowfall. 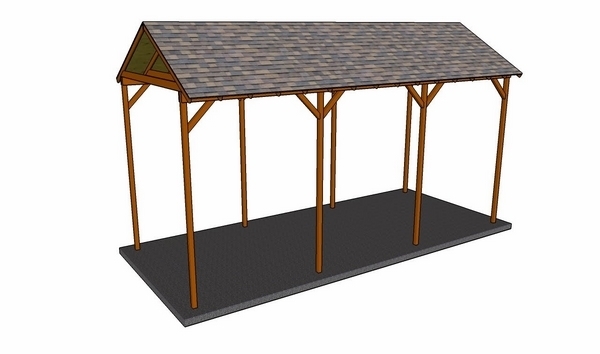 A-framed roofs will drain rain and melting snow to the sides. The roof panels can be installed vertically or horizontally. 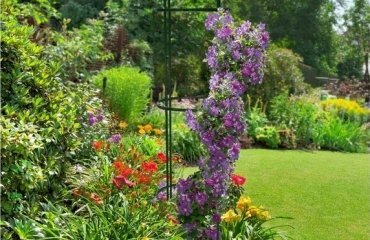 Horizontal installation is recommended for areas with heavy winds than snow and rainfall. 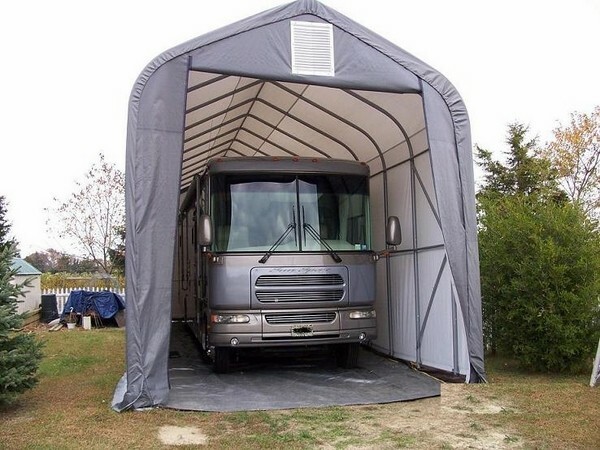 When it is impossible to build a carport for whatever reason and there is no RV storing facility in proximity to your home, portable carports and covers are a good option to provide protection and store your vehicle. It is a cost effective option which will allow you to prevent damages to the RV from exposure to sunlight as well as water damage. 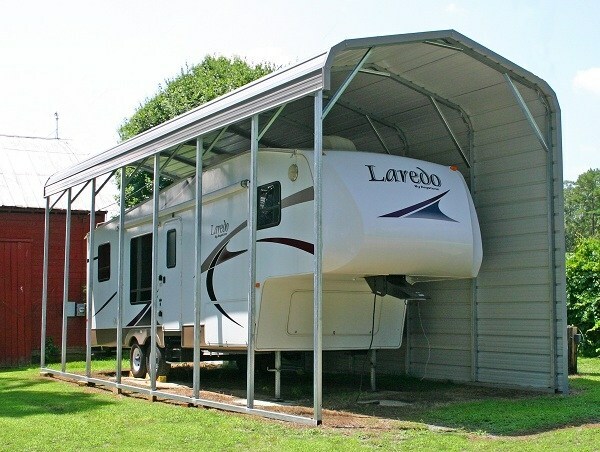 Portable RV carports and shelters are designed to be lightweight and include galvanized or powder-coated structural steel frame and a cover made of polyethylene. 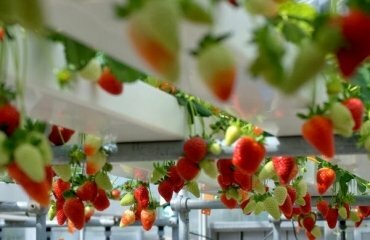 The manufacturers guarantee a long life span, but you should check the fire resistance, color options, if any, UV protection properties, and protection against fungi. 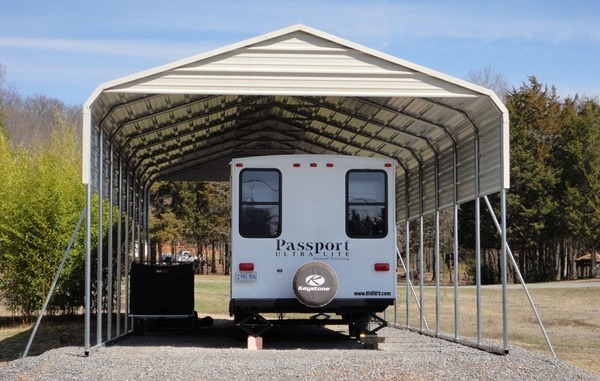 Portable carports can be installed anywhere, but again, if you opt for that type of shelter, it is better to check for limitations and local regulations concerning seasonal vehicles and storage.